I finally got time to write a post in my blog:) Its been a long time since I opened my blogger account. I feel so guilty whenever I visit buddy bloggers blog and read recipes. I have three more recipes which needs to be completed and published. Hopefully I will do it this month atleast. This idly upma is a recipe I learned from one of our family friend, when I was staying with my in-laws, last month. We went to Kanchipuram last month (before coming to Delhi of course). Our family friend was staying with us couple of days that time. Since my girls were also with us during our trip, my MIL said, its better to make some idllies and thayir saadam with us, in order to avoid eating outside as the kids get sick if we eat outside a lot. We made idly and thayir saadam for our trip and my girls had just the thachi mammu and not idly. Well my MIL will not eat leftover stuff next day, so it was me and Padma akka who had to finish those idllies. For me eating hot and steamy idly itself is a punishment. So now eating a dry and cold idly for breakfast (our servant maid said she also will not take leftover food especially idly) is really a big punishment for me. 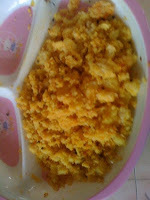 Padma akka gave me the idea of making Idly upma to make it more glamourous and she also offered that she will make one. So she started scrambling the idllies and asked me to cut the onions and also taught me how to make this upma. Here goes the recipe. Salt - only for onion and other ingredients as idly will have salt in it. This one of my favorite!!! I liked the idea of adding molaga podi. OMG,you have 4 varieties of idly upma,I am sure it will help me ..love idly upma a lot! Wonderful recipe.. First ime here.. Good job!! So Nostalgic, Amma nyabagam vanthuduthu enaku, Delicious Idly Upma!!! Hey Vidhya, Pls Collect ur award fm my Blog.